The act of reading in itself is naturally enjoyable. The consideration of new ideas, the unleashing of imagination, and that sweet “this is better than the movie” feeling. For better or worse, the productivity-engine inside of me also loves that feeling of working its way through the to-read list and adding to the done-reading list. Everyone has these lists right?! Having actual reading lists (“to do” and “done“) has shown me first hand that even if no other books are ever published there are currently enough excellent books in existence that I could go the rest of my life without re-reading any. This should have a pretty big impact on how, why, and what I read. Time is finite, my attention isn’t, and my reading time isn’t. Basically, I can’t afford to re-read books lightly! A year ago I started doing something that I haven’t done since high school: I started writing book reports. For myself! Sometimes just a paragraph summary and list of chapter titles, sometimes way more detailed, with tight point-by-point summaries of more valuable passages. Key points, a simple summary, my thoughts, a couple quotes–anything is better than nothing! Even a simple list of chapter titles is helpful. I can look these up quickly as I keep my book reports in my journal, in my code editor Sublime Text which allows me to fuzzy search files by title. 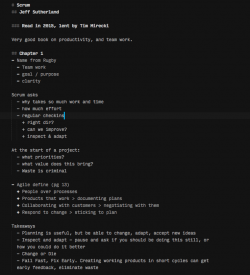 Here’s an example of my notes for the first chapter of Scrum by Jeff Sutherland. As you can see I was pretty sparse on the notes here, but capture the big ideas succinctly. The degree of detail is occasionally a reflection of the book’s impact on me, and sometimes a reaction to why I read it. In the case of books I’ll be discussing in a reading group I record way more point form skimmable reminders and reactions. As an example I recently took a systematic theology class that had a list of five recommended titles given out months in advance. Only through book reports could I read these, and speak intelligently about them months later. Slightly off-topic: Skimming a book report even months later I can remember exactly where I sat, what the weather was like when I wrote it. Memory is weird. So much information unlocked by the review of these notes. For me the book reports are for quick reference skimming; remembering the main points, and acting as an index to help me find that spot in the book again. My brain is great at creative problem solving, and not great at remembering. Book reports remove the need to remember in deep detail that which I can look up again, while reminding me of what which was worth remembering. Without book reports sometimes the reading feels like it was a waste. I wish I had started years ago! In my next reading experiment post I’ll share how speed listening made the original requirement to “never re-read” less important; going over a book again on a commute is almost negligible now. Speed listening hasn’t devalued book reports in the slightest, on the contrary; the increased speed and potential for reading books in a shorter time makes the value of the “done” list even more valuable.